Tal como avisei ontem, os próximos dias serão dedicados a mostrar-vos as promoções da Zaful e da Dresslily. Para a semana os posts já voltam ao normal e com bons conteúdos! Estão prontos para as grandes promoções da Zaful? Então vamos lá começar! This Friday is special, it's the BLACK FRIDAY (Nov. 24, 2017)(https://www.zaful.com/black-friday-cyber-monday-sales-preview-2017.html), are you already gearing up to overfill your shopping appetites? If you love a good style steal online retailer, Zaful (https://www.zaful.com/)will probably be the first port of call when shopping online. This year, Zaful Black Friday Sale (https://www.zaful.com/black-friday-cyber-monday-sales-preview-2017.html) offers you: Even more insane deals than ever & The Big Sale last even longer! But before you hop into Zaful's Black Friday Sale (https://www.zaful.com/black-friday-cyber-monday-sales-preview-2017.html), do a research and plan wisely is a smart way to save more cash. Let's check out our A-to-Z guiding list and do things right! Be ready for the biggest discount of 2017. From (November 24th - November 29th), buy 3 and get 1 for free at Zaful's best seller list (https://www.zaful.com/best-sellers/)! If that's not what you're looking for, we have our "New faves & New arrivals" zone standing by. Up to 50% OFF discounts are waiting to satiate your fashion needs! Cutthroat price is the most common thing during Black Fridays (https://www.zaful.com/new-faves/). Who doesn't love cheap goods? From November 24th - November 29th, 3 different discounts: 20%/30%/40% will be marked on selected products! 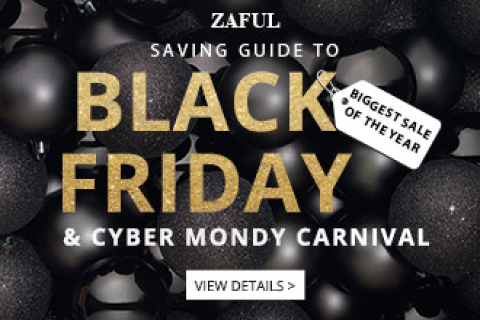 Hope you find this guide helpful, but also be advised, this is just a bit, and there are more to discover, Zaful Black Friday sale( https://www.zaful.com/black-friday-cyber-monday-sales-preview-2017.html) are waiting for you to explore. Don’t miss this opportunity or you will have to wait for another year!